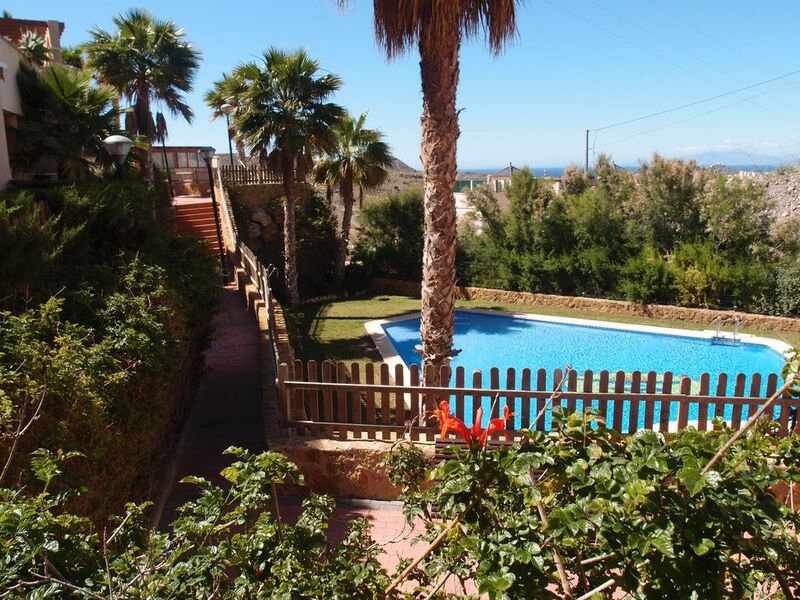 Quiet apartment in mountain overlooking Aguilas bay. Free Wifi. Swimming Pool. Very peaceful location with plenty of room for families to relax and children to play safely outside the apartment. A swimming pool with views of the bay is within a few metres. This is a very good pool for young children. The secure apartment has two bedrooms and two bathrooms. It is air conditioned. Each bedroom has two comfortable beds and the apartment will accommodate 4 people. The kitchen is well equipped with oven, hob, microwave, toaster and washing machine/dryer. There is a fridge/freezer and coffee maker. The dining area includes an oak dining table seating 4 people. There is an outside table and chairs with parasol for outside dining. Also included are relaxer chairs. Clean linen and cleaning the apartment is included in the cost. You can park cars very close to the apartment. There are steps leading from the road to the apartment so it is not suitable for disabled people or anyone unable to climb stairs. The stairs do have handrails both sides. I live near the east coast in the United Kingdom and love holidaying in Spain as I love the sun and getting away from it all. This apartment is situated in an unspoilt part of Spain and is not overrun by urbanisations. It is certainly not "little britain" and is still very spanish which I like. When we bought this apartment it was very rare to find a new apartment which overlooked the sea and was so close to the beach which this one is. I did not want to buy one inland with a long drive to the beach. This apartment benefits from a private garden and easy access to quiet community gardens which is full of palm trees and mediterranean plants. It is usually surrounded by deep blue sky and gets a good amount of sunshine. The views from the apartment and surrounding area are stunning. You can see Aguilas bay and castle along with many miles of surrounding countryside. Plenty of cutlery and cooking utensils available. Also teacloths and oven gloves. Table suitable for 4 inside and outside table available. Three flights of stairs with handrails. Unsuitable for disabled or unfit people. Very close to apartment, suitable for young children. In sun all day. El apartamento cuenta con todo lo necesario y se nota que el propietario se esfuerza en los detalles para hacer más acogedora la estancia a los visitantes. Algunos elementos del apartamento se notan desgastados por el uso de los diferentes inquilinos, la pintura de alguna habitación, algún daño en la encimera o la tapa suelta de uno de los WC. Dispone de aire acondicionado, algo casi imprescindible en la época estival en la que hemos estado alojados. La urbanización muy tranquila, los niños han estado solos en la piscina en muchas ocasiones, a pesar de estar en pleno verano. Es necesario disponer de vehículo ya que el apartamento está en lo alto de una montaña y para acceder al mismo hay que bajar varios tramos de escaleras desde el aparcamiento. Nosotros ya conociamos otras partes de la urbanización y los posibles inconvenientes y ventajas de no estar en el casco urbano, hemos pasado unos días de descanso muy agradables y no descartamos repetir. El trato con el propietario muy correcto y la relación calidad precio de la estancia me parece muy adecuada. This apartment is located at the Costa Calida, in a (quit new) urbanization "Los Collados" against a mountain, a few kilometers from Aguilas and Calabardina. This area has great beaches with clear water "in the front" and a rough rural sierra "at the rear". On the way to the apartment, you have a marvellous view over Aguilas bay. The apartment was clean and has everything what you need for living (including climate control). We (2 adults, 1 child 11 year) had a warm welcome when we arrive with the property manager of Oasis Properties (Lionel Nee). There are (were at our time) not so many peoply there, so we have everything (garden, swimming pool, etc...) almost private and it was lovely quite. For reaching the apartment, there were some stairs, but no problem for us. The swimming pool was relatively big, surrounded with real grass and palm trees. The only (personal) remark that we have, was that the depth of the swimming pool was from 0.10 to no more than 1.30 m (more designed for little children). When a part of the pool was more deeper, than this apartment was for us a 5 star apartment! This was our fourth stay in this urbanization Los Collados, so this mean already something: good price for quality apartment, situated on the scenic Costa Calida with the beautiful beaches, lovely restaurants and bars, nice fairs, among the pretty Spanish people. Tout d'abord l'appartement n'est pas véritablement en rdc ! Pour y accéder il faut descendre et monter 4 étages d'escalier car l'immeuble est construit en flanc de colline et l'accès est par le haut. Ensuite une odeur de moisi se mêle à une tenace odeur d'égout. Peu agréable malgré bougies désodorisantes et autres parfums. Bref, nous ne reviendrons pas et nous ne recommandons pas cette location. Una estancia tranquila , la casa en general bien deberían de arreglar una de las camas individuales y una de las tazas del wc, el resto ya sabíamos que era un lugar alejado y tranquilo y con muchassss escaleras , por lo demás todo correcto.Lo aconsejo. Gracias por su opinión . Estamos gald que disfrutamos de la tranquilidad y el aislamiento . No éramos conscientes de que una de las camas estaba rota ya que nadie más ha informado de ello. Tenemos una solución lo más pronto posible . Nous avons apprécié grandement notre séjour dans la résidence. C'est un endroit calme, reposant. Nous avons apprécié la piscine à toute heure et nous conseillons cet endroit aux personnes aimant la sérénité. Par contre l'escalier qui mène aux appartements en contre --bas de la résidence est très rude pour les personnes "sensibles". L'appartement en lui-même est confortable sauf que la climatisation est bruyante, le parasol de jardin (très appréciable en cette période de chaleur) est cassé, pas de cafetière électrique (mentionné sur le site pourtant) et les placards de cuisine sont bondés de nourriture périmée. Dommage!! Aguilas nous a plu on y reviendra. Merci pour vos commentaires. Très heureux que vous avez apprécié la tranquillité de l'appartement et la région. Nous étions au courant que quelque chose était cassé et réparera ou remplacera dès que possible. Het is een prima woning, alleen de ligging is jammer. Er is weinig zon! Een goede tip is misschien dat de haag goed gesnoeid wordt. In ieder geval op de hoogte van het hekje of nog lager. Goede bedden, fijn dat er een wasmachine aanwezig is. Misschien is het ook handig dat er 2 sleutels afgegeven worden want als de voordeur dicht valt (door tocht o.i.d.) en 1 persoon is weg dan heb je een groot probleem. Voor de rest hebben we het prima naar ons zin gehad. Take the motorway AP-7 or E15/A7 and turn off at the junction for Aguilas or Lorca. Los Collados is situated on the road to Calabadina just past the hotel. (Specific instructions can be provided depending on direction you are coming from). There is a new shopping mall called Aguilas Plaza only five minutes drive away.